Indian Railways passengers, various online e-wallet service providers like Paytm and MobiKwik are offering attractive discounts and cashback offers for booking rail tickets online. or via these mobile wallet applications. Popular online payments platform MobiKwik is offering an attractive 30% discount offer for booking IRCTC tickets online through its app or website. The discount shall be credited to users' account in the form of MobiKwik SuperCash. The maximum cashback amount is capped at Rs. 100 per transaction. The offer, valid for all MobiKwik users, can be used once every calendar month. 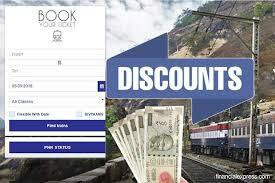 Book IRCTC train tickets online through Paytm, and get upto Rs. 100 cashback on movie ticket bookings done via the Paytm app or website. To avail the offer, apply Promocode 'TR100' on checkout while booking your movie tickets. The limited-period offer is valid on a minimum booking of two movie tickets. The cashback will be credited to user's account within 24 hours of transaction. For booking IRCTC train ticket bookings online, using the SBI Platinum Card, you get 10% value-back on every AC-class booking. Other benefits of the IRCTC SBI card include zero payment gateway charge, 1% fuel surcharge, bonus reward points, and other exciting offers from VISA.